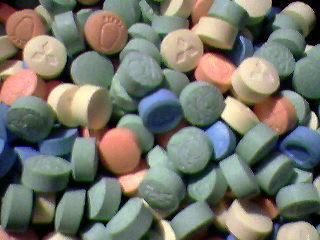 Ecstasy Pills, Ecstasy, Extacy, XTC or E is a popular drug with adolescents. This drug is available in capsule or street pill forms and comes in different colors and designs. The main chemical substance in XTC is Methylenedioxymethamphetamine (MDMA). The user gets stimulated both mentally and physically. After the initial rush, fatigue intensifies and then the initial reaction to suppressing exhaustion is masked. There is a general tendency or a feeling of intimacy towards others and this is the one of the reasons that it is popular at raves. Effects are quick and generally appear within the first hour of consumption. It is during the first and second hour when stimulation is greatest. For first time users, the effects can last until the following day. However, for most, effects disappear within the first 4 to 6 hours. When the effects of XTC dissipate, most people feel empty and depressed and this can last for days. Common side effects are tension in the jaws, irregular heart-beat, dryness around the lips, mouth and throat, shortness of breath and sometimes nausea. There have been cases where some people found it hard to co-ordinate movement, but it is likely that they also consumed alcohol. Other negative effects of XTC are panic attacks and chest pain. This depends on the quality of the ecstasy pills and the health and mood of the user. Bright lights and the environment can also emphasize the effects. Many street drugs that are sold as ‘Ecstasy pills’ are adulterated and do not contain MDMA. They contain MDEA (speed) or other dangerous substances, which come with even larger risks. When using speed, you’ll feel exhilarated and can spend a long time dancing with out stopping. Most clubs and raves are crowed and hot and the dancing is continuous. If users don’t drink enough fluids, there is a risk of muscle or kidney failure. Don’t drink alcohol and energy drinks with E.
People who have heart or blood pressure problems, asthmatic, diabetic, or epileptic should stay away from this drug. It can intensify panic attacks and psychosis. If you have a question about this drug Just ask And if you’re concerned about someone who uses club drugs and want to help, book a consultation.